True Hope and a Future: IS GOD A DEMOCRAT OR A REPUBLICAN? I think this is a reasonable question. The Israelites had just ended forty years of wandering in the desert and were preparing for their first battle. It's important to note that none of Joshua's men were warriors and all of them were recovering from their recent circumcision. Yes, it was important for Joshua to know just whose side this man was on, so I'm sure the answer he received was more than a bit startling. The commander of the Lord's army is in fact Jesus, which is why He then instructs Joshua to remove his sandals; he is standing on holy ground. Joshua did so, and I can only imagine the awe he felt bowing before the Lord Himself! Once he recovered from the experience, perhaps a considerable time later if he's anything like me, I wonder if he was a bit shaken by the content of the message. If God was sending me into battle and didn't come right out and say he was on my side, I'd find that more than a bit disconcerting. So if these were God's people, and God is the one leading them into battle, why does He say He's on neither side? Could it be because the lines aren't drawn as neatly as we'd like to think? God is for those created in His image, but He is vehemently opposed to sin. God was for His people, the Israelites, but He was against the sin of the Israelite Achan (Joshua 7). God was against the sin of the inhabitants of Jericho but He was for Jericho resident Rahab, who acted favorably on behalf of His people (Joshua 6:22-23). 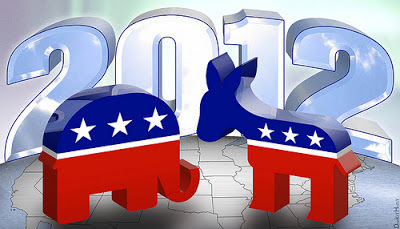 So, is God for the Democrats or the Republicans in this upcoming election? Given the precedent set in the book of Joshua, I think it's safe to say, "Neither." If God doesn't declare a "side" as His chosen people battle the pagan residents of the Promised Land, it's not likely He's going to do so now either. We, however, need to choose - not necessarily a party, but a candidate. And as Christians, our choice should be based on the truth found in God's Word. While there isn't much about voting in the Bible, mainly because nations were ruled by kings and the average person didn't have a voice, we can look to Scripture to determine where God stands on particular issues. For instance, God's position on the value of human life is very clear, as is the definition of marriage. Look into the candidates (and proposals). See where they stand on issues. Investigate their records to see if their words match up with their actions. Ask God for guidance. Ask Him to intervene in this election so the candidates elected will be the ones that will direct this nation back to Him. Multitudes of people have died for the right to vote, a right we too often take for granted. I've often wondered how quiet it would be if only those who voted were allowed to voice their opinion post-election (insert sound of crickets chirping here...). Lord, I thank you for the privelege of living in a place where my voice is heard. I pray that everyone eligible to vote will exercise their right to do so. Give us wisdom and insight to select the candidates best equipped to lead us in a manner pleasing to You. Linking up with "Soli Deo Gloria", "Titus 2sdays", "Teach Me Tuesdays", "Tell Me a Story", "True Vine Challenge", "Weekend Whatever", "Spiritual Sunday"
Amen, Lisa, to select the one who follows Biblical principles. And if by some other reason things are different, we shall put everything in God's hands. Actually we will do that anyway. Thanks for sharing at "Tell Me a Story"
You know, I had only so much time to research and almost didn't vote because I was afraid I would pick the wrong people. But, instead, I did what you did (researched to the best of my ability and time), PRAYED, and then voted. The answer is obvious to those who have done their homework. But either way, I am so glad God is on the throne. Thanks for posting your wonderful blog, Lisa. Each time I receive one of your entries I eagerly read it, knowing that it will be filled with wisdom and truth, based on the Word of God. Amen! vote issues NOT political party. Yes and amen! I love the Scripture reference and how you're using that in this post. Well done. Yes! I'm ready to vote on Tuesday! And I'm thankful for the privilege! Oh, I like your example from the book of Joshua. Yes, I have prayed, studied and voted. I rest on the assurance that God is sovereign. I continue to pray that our nation will turn back to Him. Lisa--we are neighbors at Cheryl Smith's True Vine this week. I say a hearty 'amen!' to this post. We have to speak up for what's right as believers and continue to be a light. We just finished our ballots last night and got them in the mail. (We're in Washington State). Love the way you approached this, and though He is not for a particular party, He is definitely for values and truths in His word and on His Heart. May He move strongly on those still sitting on the fence or saying they won't vote because they aren't sure... May He restore our nation to His heart and lead us in Him. May He cover this election under the shadow of His wing... as we stand in voting His heart expressed in His word, praying His blood covering, and giving Him thanks and praise... I love the promises in Joshua too, and our wall of Jericho can come down with prayer and His leading, as we sound the trumpets (even as you have here) and as we claim everyplace our "feet" walk for Him! Blessings to you today! Hi Lisa, visiting from Spiritual Sundays....as the ads on TV become more negative, the reports more biased, how refreshing to be reminded of the truth you spoke of here. Thank you.